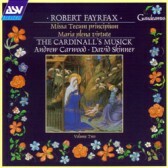 The Missa Tecum principium is perhaps Fayrfax’s most beautiful mass setting, especially the final movement setting the words of the Agnus Dei. Taking a Christmas melody as its theme, it is obviously a later work in the composer’s output. Serene and also powerful, it shows a master musician at work. With it is a most remarkable antiphon – Maria plena virtute. This is a meditation on the Passion and can be counted as the composer’s finest work. Here also are the plangent sounds of the Frideswide Consort playing three exquisite instrumental pieces.